The financial position of the US has declined dramatically. The US is heavily indebted, both government and consumers. The US trade deficit both in absolute size and as a percentage of GDP is unprecedented, reaching more than $800 billion in 2005 and accumulating to $4.5 trillion since 1990. With US job growth falling behind population growth and with no growth in consumer real incomes, the US economy is driven by expanding consumer debt. Saving rates are low or negative. The federal budget is deep in the red, adding to America's dependency on debt. The US cannot even go to war unless foreigners are willing to finance it. Our biggest bankers are China and Japan, both of whom could cause the US serious financial problems if they wished. A country whose financial affairs are in the hands of foreigners is not a superpower. The US is heavily dependent on imports for manufactured goods, including advanced technology products. In 2005 US dependency (in dollar amounts) on imported manufactured goods was twice as large as US dependency on imported oil. In the 21st century the US has experienced a rapid increase in dependency on imports of advanced technology products. A country dependent on foreigners for manufactures and advanced technology products is not a superpower. Because of jobs offshoring and illegal immigration, US consumers create jobs for foreigners, not for Americans. Bureau of Labor Statistics jobs reports document the loss of manufacturing jobs and the inability of the US economy to create jobs in categories other than domestic "hands on" services. 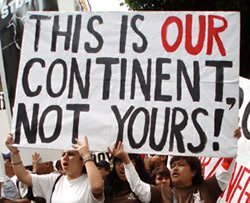 According to a March 2006 report from the Center for Immigration Studies, most of these jobs are going to immigrants: "Between March 2000 and March 2005 only 9 percent of the net increase in jobs for adults (18 to 64) went to natives. This is striking because natives accounted for 61 percent of the net increase in the overall size of the 18 to 64 year old population." A country that cannot create jobs for its native born population is not a superpower. In an interview in the April 17 Manufacturing & Technology News, former TCI and Global Crossing CEO Leo Hindery said that the incentives of globalization have disconnected US corporations from US interests. "No economy," Hindery said, "can survive the offshoring of both manufacturing and services concurrently. In fact, no society can even take excessive offshoring of manufacturing alone." According to Hindery, offshoring serves the short-term interests of shareholders and executive pay at the long-term expense of US economic strength. Hindery notes that in 1981 the Business Roundtable defined its constituency as employees, shareholders, community, customers, and the nation." Today the constituency is quarterly earnings. A country whose business class has no sense of the nation is not a superpower. By launching a war of aggression on the basis of lies and fabricated "intelligence," the Bush regime violated the Nuremberg standard established by the US and international law. Extensive civilian casualties and infrastructure destruction in Iraq, along with the torture of detainees in concentration camps and an ever-changing excuse for the war have destroyed the soft power and moral leadership that provided the diplomatic foundation for America's superpower status. A country that is no longer respected or trusted and which promises yet more war isolates itself from cooperation from the rest of the world. An isolated country is not a superpower. A country that fears small, distant countries to such an extent that it utilizes military in place of diplomatic means is not a superpower. The entire world knows that the US is not a superpower when its entire available military force is tied down by a small lightly armed insurgency drawn from a Sunni population of a mere 5 million people. Neoconservatives think the US is a superpower because of its military weapons and nuclear missiles. However, as the Iraqi resistance has demonstrated, America's superior military firepower is not enough to prevail in fourth generation warfare. The Bush regime has reached this conclusion itself, which is why it increasing speaks of attacking Iran with nuclear weapons. The US is the only country to have used nuclear weapons against an opponent. If six decades after nuking Japan the US again resorts to the use of nuclear weapons, it will establish itself as a pariah, war criminal state under the control of insane people. Any sympathy that might still exist for the US would immediately disappear, and the world would unite against America. A country against which the world is united is not a superpower. NASA researchers are working on a design for a new spaceship for the Mars mission which will be powered by anti-matter, RAW STORY has found. If successful, "perhaps the first humans to reach Mars will arrive in spaceships powered by the same source that fired starships across the universes of our science fiction dreams," writes Bill Steigerwald of the NASA Goddard Space Flight Center. Most self-respecting starships in science fiction stories use antimatter as fuel for a good reason – it’s the most potent fuel known. While tons of chemical fuel are needed to propel a human mission to Mars, just tens of milligrams of antimatter will do (a milligram is about one-thousandth the weight of a piece of the original M&M candy). Antimatter is sometimes called the mirror image of normal matter because while it looks just like ordinary matter, some properties are reversed. For example, normal electrons, the familiar particles that carry electric current in everything from cell phones to plasma TVs, have a negative electric charge. Anti-electrons have a positive charge, so scientists dubbed them "positrons". How Immigration Is Being Used To Destroy The US By The Elite. Illegal immigration has been the hot topic on the news this past week. Everyone has been talking about the 500,000 people that gathered in Los Angeles to protest the immigration law which has been proposed by Congress. In this article I want to explain why immigration is being used as a tool to divide and conquer the United States. Throughout history, divide and conquer is a technique which has been used to destroy many tribes. Groups of people who were traditionally hostile to each other were put in the same place, and this caused them to slaughter and kill each other. This trick was done very successfully by European nations in Africa, and the effects of it can still be seen today. The same thing is occuring in the US. People who are not American citizens want to live and work here. Many of them don't pay taxes because they don't have a social security number, and leave the tax burden on American citizens. Now, while illegal immigration can refer to anyone who comes into the US illegal, the bulk of this issue has been directed at hispanic people. Many people tell me that they should be able to work in the US and make better lives for them and their families. My response to that is why can't the governments of Central America stop enslaving their people and create a democratic society, so they won't be tempted to flee here? Some people may read this and think I'm a racist. That isn't true, although that is what the corporate controlled media would like you to believe. Racism has nothing to do with this issue, and I hate when people bring it up. The issue is corrupt governments and corporations. They are the real enemy, not the illegals. When companies hire illegals to do work for $3 an hour, though that may be a lot of money compared to where they came from, by US standards that is poverty. This illegals are slaves. Many of them try to live the American dream by going out and leasing cars, houses, and other items. Many of them get in debt with credit cards and other loans. Because of their low wages and lack of education, they are put in a situation where they cannot get out. They might as well have chains around their arms. Many middle class Americans believe that George W. Bush cares about illegal immigration. Many think that he wants to stop it. Many of these same Americans hate hispanic people and use race as an issue to get them to leave. In reality, Bush needs illegals to come to the US. More have come here since he became president in 2000. Illegal immigrants help drive down the wages and push the US towards a third world country. With jobs going to India and China, and illegals entering the country in record numbers, the middle class will be destroyed in about 10 to 20 years, if not sooner. America will become like China, Mexico, or Russia. Either you're rich, or you're poor. This is how it has been in most civilizations for thousands of years. America was different, now it is going back to the old system of doing things. All you Americans reading this who want fight illegals or kill them, read this carefully. You are doing what the government wants you to do. When the illegals start rioting, and fights break out, this gives the military industrial complex the only excuse it needs to declare martial law and bring in a police state. Bush and his cronies hope an all out civil war breaks out. With an estimated 12 million illegals or more, it is very likely. Don't think for a second that certain elements of the US government didn't know illegal immigration would become a problem. They knew it would be a problem, and that is why they allowed it to reach the level it has reached now. The need the US to crash and burn, so that "they" can bring in a New World Order. Hispanic hate groups like La Mecha and La Raza who advocate killing whites and blacks are funded by old rich men in New York. The stage is being set for the US to fall. You have to understand that illegals ARE NOT the problem. It is our corrupt government who allows them to come here in the first place, driving down the wages and pushing the country into a slave society.